As I walked to the nearby market, I heard shouts and screams coming from a large crowd. The mob seemed to be cursing someone. I wondered why the multitude had gathered, why they were so angry and why some women were screaming and others crying. What could possibly be taking place? These thoughts flashed through my mind as I rushed to the street to see what was happening. “Because he’s a liar and a fraud!” the woman shouted back at me with such venom in her heart. Her anger and hatred frightened me greatly; I had to take a step back away from her. The man carrying the cross was Jesus? How could this be? This could not be the man I had heard speak such beautiful words of wisdom. This could not be the man I had gone to see in the wilderness – to hear his stories and to see his miracles of healing. This could not be the man whose smile and laughter had been so infectious you found yourself grinning from ear to ear; whose tender words of compassion and love eased the fear in my heart. This couldn’t possibly be the teacher I had come to love and adore. No! This couldn’t be that Jesus, surely! Tears began to stream down my face. How could this woman beside me be so blind? Hadn’t she heard Jesus speak? Hadn’t she seen him heal the sick? Hadn’t she seen him deliver those with demon spirits? Then I saw Jesus fall to the ground; the heavy cross falling on top of him. The Roman soldiers beat him again and again, shouting for him to get back on his feet. “STOP! STOP HURTING HIM!” I screamed at the soldiers. But they didn’t stop. They continued to beat him mercilessly. Then the soldiers found a man in the crowd and forced him to carry the cross, for Jesus was too weak to even stand. Eventually, he managed to get his feet under him, placed his shoulder under the wooden cross and walked alongside the man chosen to carry the heavy bane of misery. I followed the angry mob to the hill that is called ‘The Skull’. Crucifixion is a common occurrence here in Jerusalem. It is used as a means of execution by the Roman Empire in which the condemned person is tied or nailed to a large wooden cross and left to hang there until they die. But, what crime had Jesus committed? What had he done to deserve such a slow and painful death? I knew in my heart they were crucifying an innocent man. Jesus finally reached the top of the hill; the crowd jeering and mocking behind him. There were two men already on the hill. They were being crucified as we arrived. The soldiers threw Jesus to the ground and beat him again. As he received blow after blow, he crawled to the cross, lay on his back and stretched out his arms. 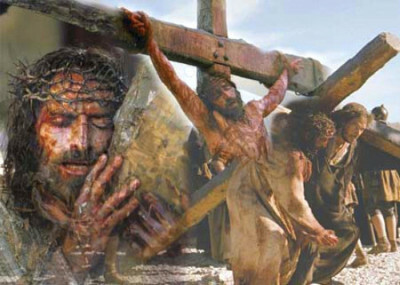 Jesus cried out in agony as long thick nails were hammered into his hands and feet. I could not bear to watch. After a long wait the cross was lifted off the ground and my Lord hung on the cross between the two criminals. Dark threatening clouds began to form above us. It was as if the heavens were grief-stricken by the scene taking place below. I was shocked to hear him ask God to forgive those who had beaten him, betrayed him, cursed him, and condemned him to die; to forgive those who had caused him so much pain. Then I realized it was because he loved them. It was as simple as that. Jesus had told us that he had come into the world, not to condemn it, but to save it. But a part of me was confused. How could he save anyone if he couldn’t even save himself? Had those angry people been right in what they had said about him? The crowd scattered as the heavy raindrops pelted down upon them. There was nothing else to see. The three men would be dead soon anyway. The Anointed One took one last breath. “It is finished,” Jesus said and finally died. My heart felt as if it had been ripped out of my chest, thrown to the ground and trampled in the mud. If Jesus was the Son of God, how could God the Father allow his son to be led to slaughter as Jesus had been? My heart was shattered and I wept bitterly. Jesus was taken down from the cross. Mary, his mother, cried out in her grief. One of the apostles stood beside her. This was too much for me to bear but I knew I could not leave. I saw them wrap him in a long linen cloth and his body was taken to a new tomb. Since this happened on Friday afternoon, the day we prepared for the Sabbath, Jesus’ body would have to wait to be embalmed. I stood outside the tomb and waited until a large stone was rolled to cover the entrance. There was nothing else I could do but return home to prepare for the Passover. I couldn’t believe that Jesus, the Messiah, was gone! My thoughts were troubled. My heart was broken. I was grieving. Nothing would ever be the same again. But then, later in the week, I heard news that Jesus had risen from the dead and he had been seen by the apostles and other disciples! A part of me wanted to believe, but the story made no sense. People don’t rise from the dead, do they? I had to find out for myself. As I rushed to a friend’s house, a man in a white robe appeared beside me. “Where are you going?” the man asked. “Then you shall see him,” the man said. There was something about his voice, something very familiar. My heart leaped with joy! I looked up. It was Jesus! His smile lit up his beautiful face and I began to weep. “My Lord, you’re alive!” I muttered, as I knelt before him. “Peace be with you. Go and tell my brothers and sisters what you have seen and heard. Tell them I am ascending to my Father and your Father, my God and your God. Tell them to believe for I have come that they may have life, and that they might have it more abundantly. Tell them there is no other way into the Kingdom but through me, and tell them…I love them,” Jesus said and then he disappeared. It was true! Jesus had risen from the dead!